One aspect of entrepreneurship and new product development that can be overwhelming is the thought that any new product or idea must be dramatically different from everything else out there. Actually, small changes can create a totally different product and lead to an entrepreneurial venture. So try this: Develop a Chindogu. From Urban Dictionary: 1. From Japanese, literally ””accessory of a weird way”. It is a totally useless invention that seems to be “useful” but in reality it isn’t. It is usually done as an art form. I once took an innovation course (thanks, Professor Barry Bayus!) where I had to develop my own Chindogu. Mine was a cup holder attached to a life jacket. I started by thinking about sports that I do and the items I use while doing these sports. Mainly I was thinking about sailing, one of my passions, and that I like to drink a canned beverage while out on the water. I sail small boats generally so I don’t have my hands free to hold one. Solution? 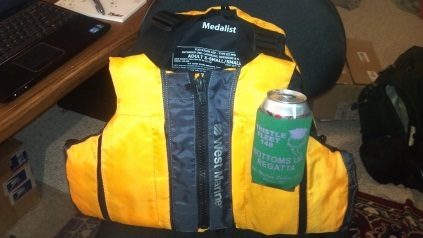 A cup holder on my life jacket, the inspiration from seeing the Chindogu example of the man’s suit soda holder. * As with any Chindogu, though, my invention had problems that made it impossible to use. The first is that in using my arms to sail the boat, the can holder will totally get in the way. The second one is that each time I might lean over to do something in the boat, or if I lean back to help balance the boat, I could end up spilling the can’s contents all over myself and the boat. Hence what seems like a great idea at first is actually useless. Of course, as a Chindogu, that was the point. Still, my final design came from modifications and combinations of concepts and ideas with which I was already familiar. How are Chindogus and entrepreneurship related? New ideas come from the information we already have in our heads, mixed with things we may see or hear about, and then blended together into a new vision, direction, or perception that changes our frame of reference and brings us something new. Many ideas will likely flow through our head as we think about the areas of expertise we already have, the key is to realize which ones are worth pursuing. I welcome examples you’ve seen of where new ideas have come from, please share in the comments below. This entry was posted in Business Strategy, Entrepreneurship and tagged Business, chindogu, entrepreneurship, Founders, innovation, Kenan-Flagler business, learning, New ideas, new product development, teaching. Bookmark the permalink.